The grey plover (Pluvialis squatarola), also known as the black-bellied plover, belongs to the family of lapwings, the Charadriidae. The grey plover species is distributed in dry open tundra of Alaska, Canada and Russia and also in coastal areas throughout the world. These plover species are mostly migratory birds. These plovers are polytypic species. The grey plover (Pluvialis squatarola) is a medium-sized plover, measuring 25 to 30 cm in length and weighing 160 to 400 grams. The wingspan is 70 to 80 cm. 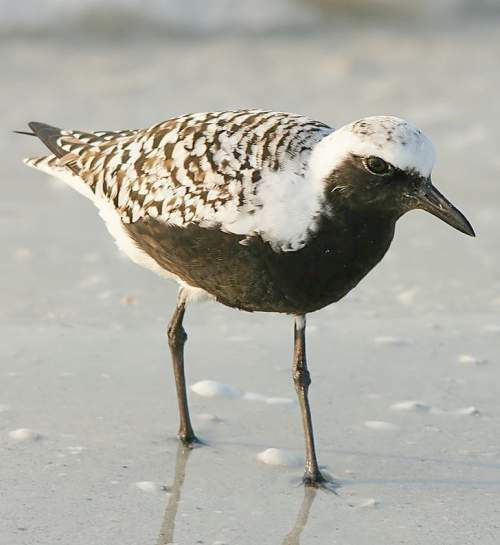 In summer breeding plumage, the grey plover has white upperparts with black spotting. The underparts are black. The lower belly, vent region, rump and undertail are white. The forehead, face, ear coverts and throat are black. The tail is white with black barring. The wintering grey plover has grayish brown upperparts with white spotting. There is a whitish supercilium. The throat, breast and upper belly are whitish with sparse grayish brown streaks and spots. The inner flanks and axillary feathers are black. The bill is sharp and heavy and is black in color. The irises are blackish. The legs and feet are blackish. The call of these plover species is a plaintive, drawn-out whistling sound. The breeding populations of the grey plover are distributed in dry open tundras in northern coasts of Alaska, Canada and Russia. The wintering populations are distributed in coastal areas throughout the world. In India, wintering grey plover species are distributed in the states of Gujarat, Maharashtra, Goa, Karnataka, Kerala, Tamil Nadu, Andhra Pradesh, Telangana, Odisha and West Bengal. Vagrant grey plovers have been observed in Chad, Botswana, Burundi, Zambia, Swaziland, Rwanda, Niger, Malawi, Mali, Lesotho, Christmas Island, Cook Islands, Fiji, Nauru, Gibraltar, Iceland, Luxembourg and Laos. The Important Bird and Biodiversity Areas (IBA) of the grey plover species in China are, Yalu Jiang Estuary, Laizhou Wan, Shuangtai Estuary, Inner Gulf of Liaodong and Chongming Dongtan Nature Reserve. The IBA in USA is Teshekpuk Lake-E. Dease Inlet. The IBA of the grey plover in United Kingdom are, The Wash, The Swale, Humber Estuary, Portsmouth Harbour, North Norfolk Coast, Mid-Essex Coast, Chichester and Langstone Harbours, Ribble and Alt Estuaries and Stour and Orwell Estuaries. The IBA of the grey plover in Russia are, Seskar island, Lower Yuribey and Upper and Middle Yuribey. The IBA in Saudi Arabia are, Jizan Bay and Tarut Bay. The IBA of plovers in Oman are, Barr al Hikman and Masirah island. These grey plover species do not normally occur in forests. They normally occur in altitudes from 0 to 100 meters. 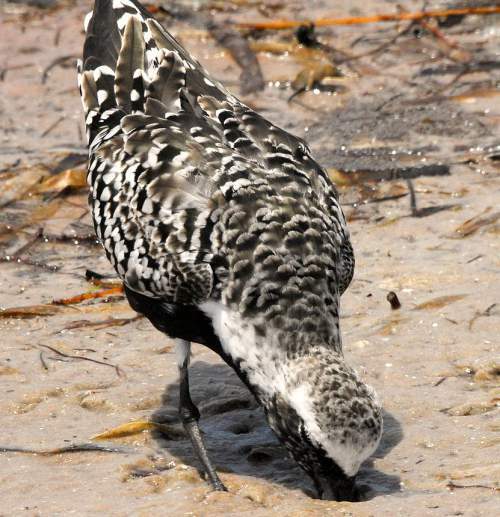 The natural ecosystems and habitats of these grey plover species include, Arctic tundra, forest tundra, tundra grasslands, coastal marine lakes, intertidal mudflats, rocky, sandy, shingle shorelines, lagoons, estuaries and coastal freshwater Lakes. The diet of this grey plover consists mainly of insects and insect larvae in the breeding grounds. Polychaete worms, earthworms, molluscs, crustaceans, insects, insect larvae are their primary food. These grey plovers forage on shallow, submerged land as well as dry land. The breeding season of these grey plover species is during May and June in most of their breeding range. They are monogamous and pair for several years. They breed as solitary pairs, well-dispersed from other nesting pairs. The grey plover nesting sites include, the high Arctic uplands (between the treeline and the coast), tundra with sedge, moss or grass, ridges in tundra marshes and raised river banks and beaches. The nest is a shallow scrape on dry open ground. The grey plover clutch contains three to four, buff colored eggs with dark brown blotches. Both the parents incubate the eggs and raise the young. The chicks hatch out after 26–27 days and fledge after 40 days. These grey plover species are fully migratory birds. The breeding populations are distributed in dry open tundras in northern coasts of Alaska, Canada and Russia. They migrate southwards during July, August and September. The juveniles leave one month after the adults. 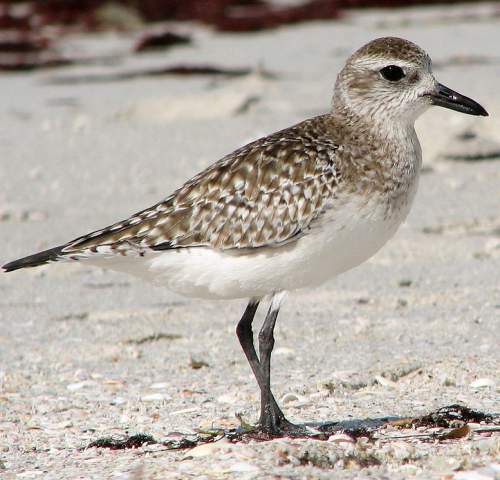 The wintering grey plovers are distributed in coastal areas throughout the world. The return migration to the breeding grounds takes place during May and June. Young birds remain on the wintering grounds until their second summer. The global population size of the grey plover (Pluvialis squatarola) is estimated at 738,000 to 935,000 individual birds. The overall population trend of the species is considered to be declining. In most of its range, this plover species is reported to be common to rare. The generation length is 6 years. Its distribution size is about 17,300,000 km sq.km. Habitat alteration and destruction, climate change, severe weather, hunting, predator pressure and capture of adults and juveniles as pets and display animals are the main threats that are endangering the survival of these plover species. The grey plover (Pluvialis squatarola) does not approach the thresholds for being Vulnerable either under the range size criterion, or under the population trend criterion or under the population size criterion. The IUCN (International Union for Conservation of Nature) has categorized and evaluated the plover species and has listed it as of "Least Concern". The CITES (Convention on International Trade in Endangered Species of Wild Fauna and Flora) status is ‘Not Evaluated’ for grey plover (Pluvialis squatarola). The three recognized subspecies of grey plover (Pluvialis squatarola) are: Pluvialis squatarola squatarola (Linnaeus, 1758), Pluvialis squatarola tomkovichi Engelmoer & Roselaar, 1998 and Pluvialis squatarola cynosurae (Thayer & Bangs, 1914). Current topic in Birds of India: Grey (black-bellied) plover - Pluvialis squatarola.